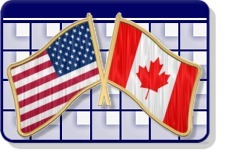 Description: Our 2015 Canadian Holiday Schedule includes only the holidays that are unique to Canada and not listed in the U.S. Holiday schedule. This schedule is recommended if you plan to add the U.S. Holidays onto your calendar. Using this schedule will avoid duplicates for holidays observed both in the United States and Canada. All events include a brief description of the holiday and a link to our holiday information page where you can read about the history and origin of the holiday, listen to holiday music, view pictures, and more.